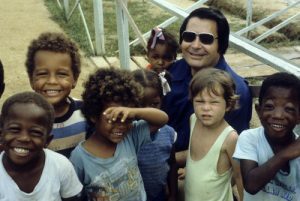 It’s the 40th anniversary of Jonestown. I’ve read most of what’s been written about this unspeakable tragedy and wrote of it in my novel White Knight (or how one man came to believe that he was the one who caused the San Francisco City Hall killings and the Jonestown Massacre). I’ve come to conclude that essence of the mass killings of Jonestown was white supremacist genocide. 70% (691) of the victims were black, and most tragically, 303 were minors. Yes, Jones was a paranoid, narcissistic, drug-addled demagogue, but there are a lot of those in the world and they don’t all kill 918 people. And it wasn’t just Jones. Most of the people were probably coerced one way or another into the “revolutionary suicide,” but what about the 20 or so largely white people of Jones’s inner circle? They were the ones who did the coercing. Wouldn’t one of them conclude that this was crazy and just shoot Jones? Results reflect intentions. The ideology if not the practice of the People’s Temple was firmly against racism, which is why it attracted so many black people in the first place. But in retrospect, that ideology – whether Jones or anyone else believed it or not – was like the cheese in a mousetrap. To say that the massacre decimated the black community in San Francisco is an understatement. It’s been estimated that every killing severely traumatizes at least ten other people; upwards of 9,000 people then suffered from severe trauma because Jonestown. It’s not an unrelated fact that the black population of San Francisco was 13.4% in 1970, 6% in 2018. This is daring, public, personal, and difficult. Bravo! I know the sharp tenderness of your pen. Blog on…. And was not that @ the time of the other religious group who opened fire on the authorities who returned fire & ended up burning down their encampment in Texas? What was that group’s name? Branch Davidson Waco Texas 1993 (15 years after Jonestown. 80 people killed. Somewhat similar but different.